4 x 10 Marquis Antique Brass Plated Floor Register Discounts Apply ! 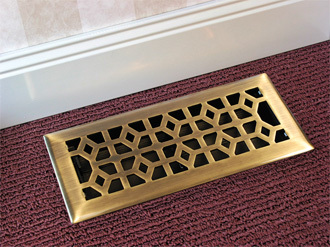 The Marquis style durable steel floor register by Accord Vents has a rich, lustrous antique brass finish to complement your other brass fixtures. Its strong steel core can hold up to 200 lbs of weight, thus it is a great choice for rooms which contain heavy pieces of furniture. The sturdy steel damper allows for complete air flow control without sacrificing aesthetics or quality. Order today to see why these floor registers from Accord Vents are such a great buy. Regarding measurements: Please ensure that you are measuring the actual size of the hole into which this product will be placed. Do not measure faceplate for dimensions. For instance, if floor hole size is 4 x 10 inches, please order a 4 x 10 inch register. Faceplate size: 5 3/8 x 11 3/8 inches. 2 other sizes available: 4 x 12 and 4 x 14. Please note: Please allow 2-7 business days to ship directly from the manufacturer.